The Ice Women cometh – why are so many ladies choosing to swim outdoors without wetsuits? It may not be how most of us choose to exercise but ice swimming is becoming increasingly popular as this weekend’s sell out Big Chill Event in Windermere shows. Chris Price speaks to the women who venture out into our lakes, rivers and seas all year round without a wetsuit and asks why? While most of us sit shivering at home huddled by the fire at this time of year, there’s a growing number of women (and it is mostly women) who are putting on their swimming cossies and heading down to their nearest lake or pond for a refreshing dip in the water. Outdoor swimming, or open water swimming, isn’t just gaining popularity as a summer past time to cool ourselves down. Those who are keen to feel the invigorating effects of often exceptionally cold water are also taking the plunge – without the protective covering of a wetsuit. For Gabs Dickinson, who runs North Wales based outdoor swimming company Gone Swimming, it’s an activity that’s always attracted more women than men. Why? “Because women are fatter than men and can cope better,” she says simply. “We have a lot of people who only want to come on our trips in the winter because that’s the temperature they prefer.” For Pauline Barker who swims outside all year round in Devon and Cornwall it’s because women have a ‘higher pain threshold’. “Just think of childbirth,” she says. To those of us who prefer the heated environment of an indoor swimming pool where water temperatures are usually close to 30 degrees centigrade, it may sound like insanity. But Gabs Dickinson insists it’s more than just swimming up and down as you would in an indoor pool. “At this time of year it’s a real social thing. You go with a couple of mates, you take a flask of hot chocolate and some big wooly towels and you’re maybe in the water for a few minutes. There is something about swimming outdoors that can make you feel a bit smug too, she reckons. “You walk off a mountain or carry on walking down a footpath and you see all these people bundled up in clothes and you’ve just been down to your swimming cossie. It may be icy around the edges or snow’s falling and you just think ‘I’ve had the best day out of all of you’”. Pauline Barker also agrees there is a social side of swimming outdoors in the winter that women, in particular, enjoy: “We swim in a group and go for a big fried breakfast afterwards,” she says. 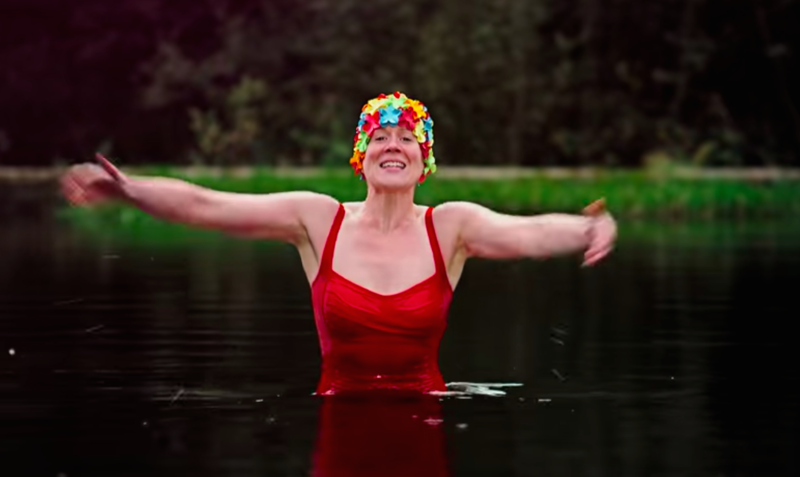 According to open water winter swimmer Kate Vines, who recently featured as the ‘lady in the lake’ (see pic below), much of the appeal is being able to have a chat and, most importantly, a piece of cake after the swim. “We love to swim for fun and for training purposes, knowing when we need to get a wriggle on, and when we can afford the time to stop and chat,” she says. “Every morning dip starts with our exclusive rendition of Destiny’s Child’s Bootylicious which gets us ready to enter the cold, brown water,” adds Kate who completed the second fastest two person Channel Relay swim ever in 2011, raising £15000 for Teenage Cancer Trust in the process. Above: Kate Vines from Visit England, Discover England TV Ad. That’s not to say that winter swimming is just one big social event. To many it’s a serious sport too. Believe it or not there are people out there who like to push their bodies to the absolute limit of cold water endurance. This phenomenon really began with American swimmer Lynne Cox who was the first person to complete a mile swim in zero-degree water in Antarctica in 2002 (she wrote a book about her experience, Swimming to Antarctica, two years later). She’s inspired literally hundreds of ‘ice milers’ as they are known, many of whom will be head off to Lake Windermere to compete at this weekend’s sold out event, the Big Chill Swim. Now in its third year the event will see 800 swimmers taking part in a number of cold water swimming events, including the 30m ‘head up’ breaststroke, 60m freestyle, 120m freestyle and the 450m ‘endurance’ swim – all which must be completed without a wetsuit on in temperatures of around 2 degrees centigrade. However, it’s the Big Chill Swim 1000 – a 1Km event around the marina – taking place on Sunday which attract the most respect as well as trepidation. Undoubtedly one of the biggest challenges of swimming in really cold water is the gasp reflex where you put your head in the water and instantly feel like you’ve lost your breath. “If you jump into water and you’re not acclimatised you will gasp and water will go into your lungs. That’s how people drown,” says Lynne Roper, Safety and Press Officer for the Outdoor Swimming Society (OSS) which has nearly 15,000 members. For Gabs Dickinson the key is to acclimatise slowly by splashing water on your face and then lowering yourself gently into the water. “You have to make sure you’ve got over that initial gasp and got the situation under control before you take your feet off the floor to swim,” she reckons. It’s also a good idea to wear neoprene socks and neoprene gloves just takes the pain away because it’s the extremities of your body (in particular your hands and feet) that get really cold. Wearing a thick cap or two is also a good idea because there are a lot of nerves in the head. “You get that ice cream head and neck feeling if you get really cold,” says OSS’ Lynne Roper. As well as the initial shock of the cold water which quite literally takes your breath away there is also the added potential risk of a heart attack, especially after just getting out of the cold water. “There’s the after drop which means when you get out the water you are still cooling down for ten minutes afterwards,” explains ‘ice miler’ and swimming coach Pauline Barker. “That’s the danger zone when all the cold blood in your extremities starts recirculating back through your core including your heart.” Pauline teaches the importance of getting dressed very quickly after the swim and drinking a hot chocolate straight after getting out of the water. According to Dr Mark Harper consultant anaesthetist and year-round Brighton sea-swimmer there are some risks of swimming in very cold water, but not as many as you might think. “The risk of swimming in the sea to people with treated hypertension [high blood pressure] is probably no different to that of those with normal blood pressure,” says Mark who is also a cold water expert for the OSS. “The risks are even lower if people are acclimatised to swimming in the cold. My advice would therefore be to start your outdoor swimming when the water is at its warmest.” Generally most of the women I spoke to for this article became acclimatised to cold water swimming by gradually staying in the water for longer periods over the summer and autumn until they were ready to swim all year round. What’s more, most agree that the potential health benefits of swimming outdoors massively outweigh the small risks. These include better mood and better metabolism (especially with regard to the way the body handles sugar). “There is even evidence to support the theory that cold adaptation, which can be achieved through open water swimming, may actually reduce the overall risk of a heart attack,” claims Mark Harper. Interestingly there is also scientific evidence for a phenomenon which has been named by cold water swimmer Lewis Pugh as ‘anticipatory thermogenesis’ where your body warms up your core by as much as two degrees centigrade in to protect your main organs in anticipation of a cold water swim. Anecdotally, many winter outdoor swimmers I spoke to said they suffered less from colds and flu as well as conditions like arthritis. There is currently a study taking place at Portsmouth University to establish whether there is any scientific link between health and wellbeing and cold water swimming. Taking part in this experiment is Pauline Baker who has to complete a questionnaire about her health every weekend along with her partner who doesn’t swim so they can be compared. She’s also about to travel to Ireland where she’s going to complete her third ice mile as well take part in some cold water testing for research at Dublin University. One woman I spoke to, Charlotte Leonard, who swims in Hampstead Ladies’ Ponds five or six times a week even claims it helps her with a condition she has called Ehlers Danlos Syndrome (an inherited tissue disorder). “I am able to cope without any pain relief on the days I swim. Before winter swimming I was on morphine every day. It has literally changed my life,” she says.